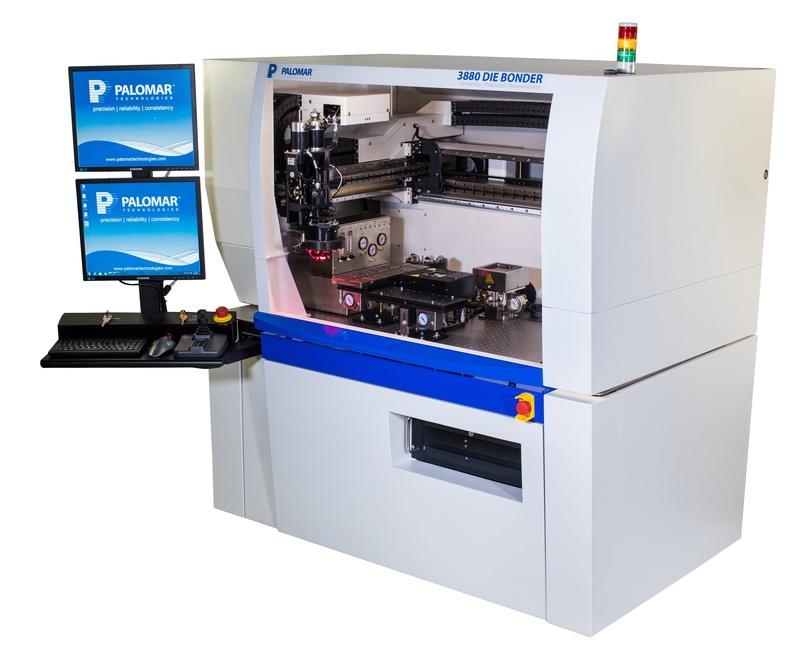 Carlsbad, CA – September 22, 2015 – Palomar Technologies, the world-leading provider of precision microelectronics and optoelectronic packaging systems, today announced the launch of its latest product: the 3880 Die Bonder. The 3880 Die Bonder features a new fully integrated Z-Theta bidirectional bond head enabling improved reliability and uniformity across a wide range of applications. The new machine’s combined fine placement accuracy, fast tool indexing time, excellent tool planarity and position precision make it the most advanced die bonder platform available today. Its large 36 x 20 inch work envelope is ideal for a versatile automated die bonder capable of handling many different part types, presentation options, and application processes. Among the innovations on this cutting-edge machine is the ability to hit Palomar's best accuracy and repeatability specs over a wider range of applications and conditions. The 3880 Die Bonder is built upon a rich set of Palomar’s pick and place features, options, and capabilities. Plus, a complete redesign of the bond head incorporates a voice coil actuator; allowing for 5-1000 gram bond forces, improved linearity, and the bidirectional tool indexing comes standard. 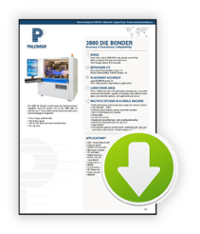 In addition, the 3880 Die Bonder is already compatible with Palomar Technologies’ VisionPilot®. It utilizes advanced geometric pattern matching technology to reliably and accurately locate parts and is built upon Cognex® vision technology. Even under the most challenging conditions, this exclusive Palomar Technologies software can significantly reduce or eliminate fixturing requirements and costs. For locating parts or features, VisionPilot® provides the maximum inspection yield and reliability available in a vision system. Palomar Technologies, a former subsidiary of Hughes Aircraft, is the global leader of automated high-accuracy, large work area die attach and ball and wedge wire bonding equipment and precision contract assembly services. Customers utilize the products, services and solutions from Palomar Technologies to meet their needs for optoelectronic packaging, complex hybrid assembly and micron-level component attachment. For more information, visit www.palomartechnologies.com.